Another new stall added extra colour and choice to Framlingham Market on Saturday. Mary Ann Coupland brought some amazing Fairtrade bags from Kenya. Ngiri-giri bags are handmade in Kenya, using local material from leather, cotton canvas and locally made traditional cotton material, called kanga, creating bright, long-lasting and totally individual bags in a variety of styles and sizes. Each Ngiri-giri bag is unique! You will find a bag for every use, from Barrel bags to Weekender bags and even Ipad and Laptop bags. 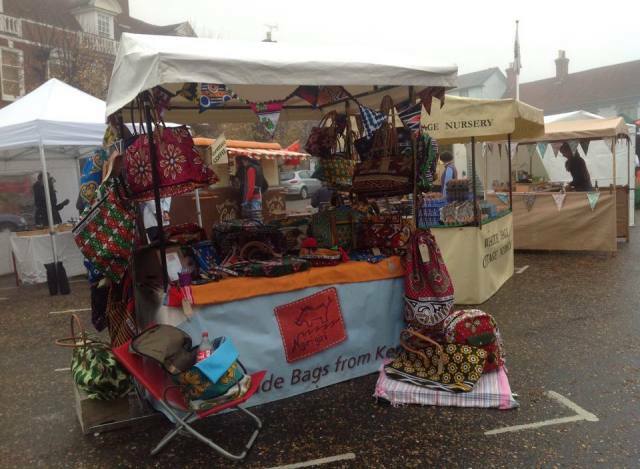 Mary will be attending Framlingham Market once a fortnight.